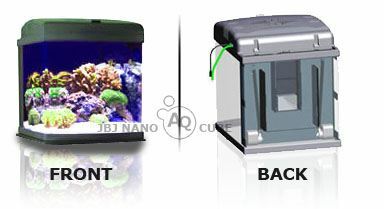 Taking the saltwater world by storm is the new LED powered JBJ nano cube fish tank. This Aquarium is great for the reef lover. You can have just about any fish in this 28 gallon beast. 700 nanometers for the growth of photosynthetic organisms while lowering energy input. Impressive 50,000 hour lifespan with a 30% reduction in output. You won’t need to change the led lamps for at least 10 years* Based on 10 hours a day. LEDs do not produce any ultra-violet radiation that is harmful for living organisms and do not contain any toxic mercury that is harmful for the environment unlike metal Halide or Sodium Mecury aquarium bulbs. 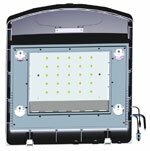 Our 89 Watt 28 gallon LED powered JBJ aquarium is the perfect nano cube system that provides comparable PAR output to our 150 Watt HQI – 14K canopy system, while consuming approximately 40% less energy. Enjoy the mesmerizing shimmering of all 3 light cycles generally only found in nature. Since LEDs turn on to full brightness without having to warm up, you can instantly light up your aquariums without the wait. These revolutionary diodes radiate heat upwards and away from the water to reduce unwanted heat transfer that can be detrimental for aquarium livestock. Ready to create some waves? Well we are. With the new pulse Duo By JBJ this dual wavemaker has everything you need to create a real life ocean in your home. Ideal for your corals and other reef inhabitants for proper growth. Included are the pumps that run off of this. The secret to our cool running top is our artistic canopy which houses an efficient aluminum heat sink for fast heat dissipation. All canopies are made from Flame Retardant ABS Plastic. The 4 cooling fans automatically turn on/off with the main lighting system. A thermal protector is also added to automatically shut of the lighting system in the event the fans fail, it will automatically turn back on once temperatures reach safe conditions. The filter starts as water enters the center overflow. The water is directed into our 3-Stage Filter Media Basket, which is installed with a mechanical sponge, chemical activated carbon, and biological ceramic rings. Our unique 3-Stage Filter Media Basket can host a variety of chemical medias to suit your needs. Cleaning is especially easy, since all you have to do is lift up on the basket handle and watch the water drain out the bottom for a simple and dry filter change. All baskets have a sliding door for added convenience. Our redesigned Ocean Pulse Duo now incorporates a memory chip for flawless performance after a power failure. Your wavemaker creates turbulent currents for a more natural reef environment. You can set it from 10 seconds to 6 minute alternating cycles. Water is returned via (2) directional return nozzles on each side of the center overflow for even natural currents. 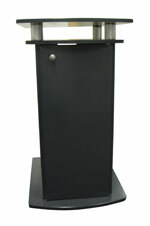 Our 2nd generation stand is the perfect complement to our 28g Nano Cube Aquarium. It offers a chiller storage compartment with pre-installed side vents for needed airflow and a shelf for storage. This contemporary design lifts the aquarium off the pedestal with 4 chrome cylinders to showcase your living reef.